With the NHL’s trade deadline about a month away, the Edmonton Oilers have fired general manager Peter Chiarelli, as backlash from fans mounted amid the team’s struggles. The team’s loss to the lowly Detroit Red Wings was perhaps something of a last straw. Among fans, Chiarelli hasn’t held a favorable reputation as a dealmaker, and even a former NHLer who was acquired by Chiarelli, back when he was the GM of the Boston Bruins, thinks so. Funny guy! 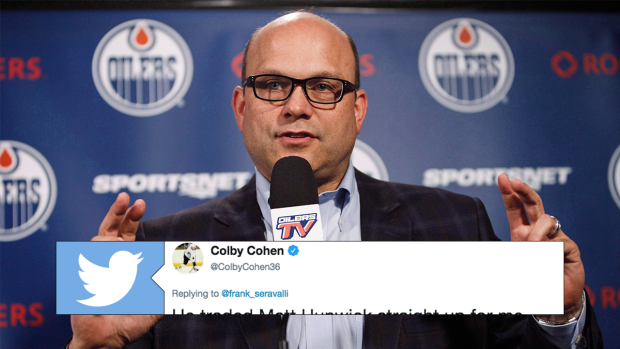 Colby Cohen for Matt Hunwick isn’t going to be one of the trades that people think of when they think about Peter Chiarelli’s career, but there certainly are a lot of what-ifs that Oilers fans have to point at — their roster might actually look better today without any GM interference.